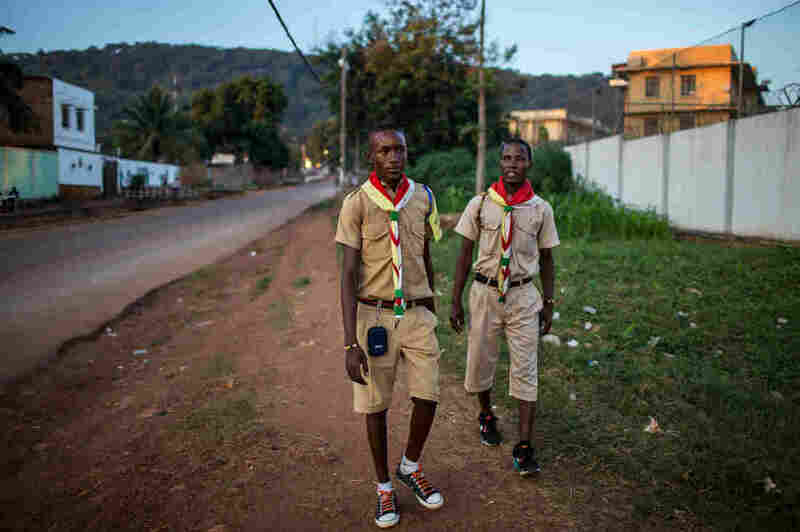 Scouts Of Central African Republic Are Prepared For Dirty Dishes — And Keeping The Peace In Central African Republic, a nation rife with violence, scouts help with public health campaigns, security — and negotiations with rival militant groups. Plus they're trained to do household chores. Members of Flambeaux â the evangelical Protestant scouting group â walk along a street in downtown Bangui, Central African Republic. Like scouts around the world, members of the Central African Republic's scouts have badges on their sleeves: for woodwork, for cooking, for navigating. But that's just one side of their accomplishments. In a nation five years into its civil war, the scouts help promote vaccination, check out rumors about Ebola, carry messages between rival military factions and more. 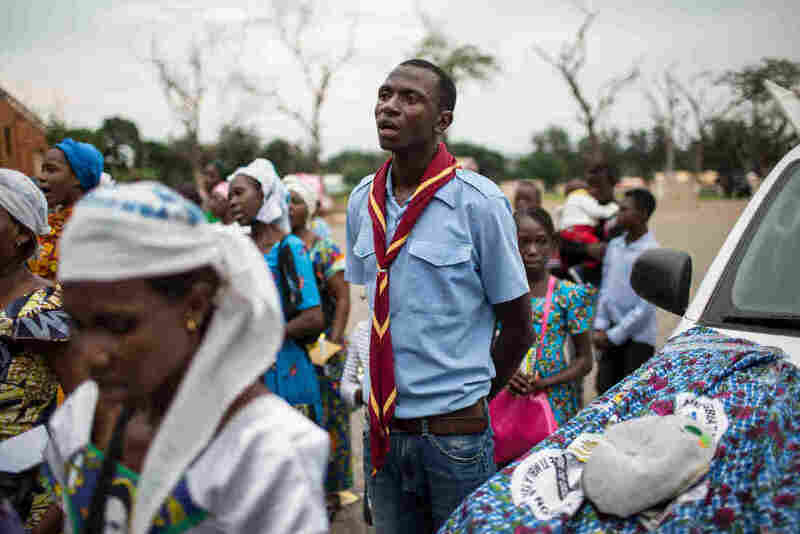 "We are here to mediate between the belligerents, to make our country livable, to stop the violence," says Rony Yannick Bengai, the secretary general of the country's Catholic Scouts Association, by far the largest of the various Scout groups in the CAR. Now 29, he became a scout when he was 7. Indeed, UNICEF regards the scouts as a critical ally. 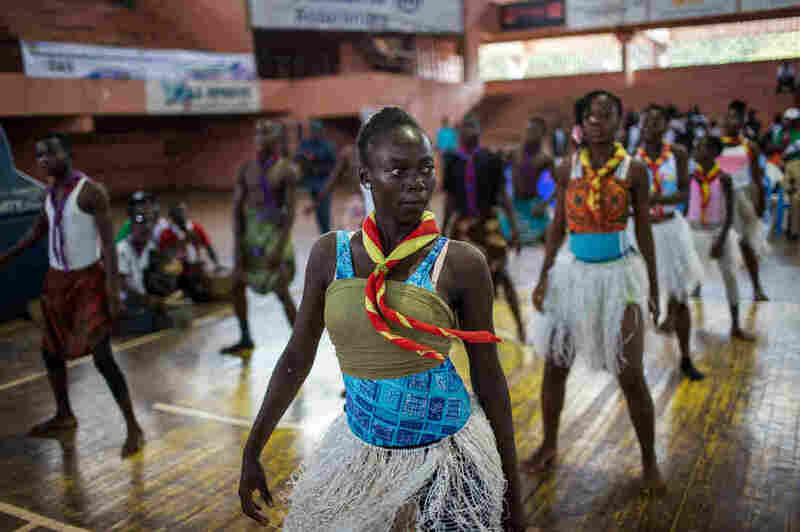 "The scouts and UNICEF signed a formal partnership in CAR in 2017," says Donaig Le Du, head of communications for UNICEF in Bangui, the country's capital. Their countrywide presence makes them "a very good asset in conducting social mobilization campaigns," says Le Du, citing the work the scouts have done going door-to-door to encourage polio immunization and putting on a play about the importance of immunization, handwashing and latrine usage for audiences of children in public places. The reason for the importance of the scouts lies in the conflict that grips the country. The landlocked Central African Republic is not regulated by anything resembling a traditional state. The government, propped up in the capital Bangui by United Nations peacekeepers, controls only small patches of territory. The rest of the country is divided between more than a dozen armed groups whose identities, allegiances and territories are constantly shifting. The violence can be cloaked in the language of religion, pitting the Christian majority against the approximately ten percent of the population that is Muslim. But more often than not the fighting is about the control of increasingly scant resources, such as food and cattle. Periodic violence means there are no international organizations either. There is no health system, no reliable communications network, no way to know whether the information about a possible Ebola outbreak is accurate without dispatching a helicopter, loaded with heavily armed peacekeepers, at much expense and great risk. But there's one reliable option — the scouts. Which is more than a little ironic because the local scouts have been suspended from the World Organization of the Scout Movement for not paying their fees. Members of the Flambeaux group of scouts, who have been engaged to act as security at an event, stand outside Le Complexe Scolaire International Galaxy in Bangui. There are a lot of scouts in CAR – about 20,000 according to scout leaders, though the conflict makes it difficult to get exact numbers. They are larger in both size and national footprint than any single armed group. By comparison, there were 14,643 U.N. peacekeepers in CAR as of November 2018. The scout movement itself is fractured. Like so much else in CAR, the scouts are divided along religious lines. There are the Catholic Scouts, evangelical Protestant Scouts known as Les Flambeaux (French for "torches") and a dwindling group of Muslim scouts, all with their own leadership who tend to be in their late 20s and early 30s and with members ranging in age from 7 to 18, though the limits are loosely enforced. And yet these members of the various branches of the country's scouts have been filling a large gap in society. They have been able to implement programs country-wide that no government ministry could. They are a familiar presence on the capital's leafy streets, strolling in small groups in their short-sleeve khaki shirts and shorts, long socks and neatly tied neckerchiefs. "At the national level we have contributed to the development of our country. We are warriors of peace," says Rony Yannick Bengai, the secretary general of the Catholic Scouts Association, the largest of the various scout groups. For Bengai, scouting has been a lifeline. "Scouts taught me how to live in a community, to develop moral, intellectual and physical capacity," he says. It also kept him off the streets — and out of the clutches of armed groups and drug dealers who prey on CAR's large numbers of jobless and unskilled young men, who have few other options to get ahead. Not only do they assist UNICEF in its work, but they have played a role in trying to defuse the civil war. When a Muslim community was trapped in the forest near Boda, in 2017, it was the scouts who mediated with the armed groups holding them hostage to secure their release, speaking with leaders from both sides to find a peaceful solution. When the Pope came to visit in 2015, it was the scouts who managed the delirious crowds that lined his route from the airport. And when humanitarian aid workers received jumbled reports about a potential Ebola outbreak in a remote, treacherous part of the country in the fall of 2018, where there was no government or international community presence, it was the scouts who were consulted as the first line of inquiry, asked to verify if there was indeed an outbreak of hemorrhagic fever and whether it had the hallmarks of Ebola. "Everything we do is to transmit the message of peace," says Abdelwadid Gakara, 24, a leader in the Muslim Scouts Association. "A good scout is someone who is on good terms with everyone." Ngoaporo Ghislain-Oxwold, 17, and Boy-Fini Mikael, 18, weren't sure about joining initially. But slowly they came around as more and more of their friends joined. "We used to stay in the neighborhood and do nothing," Ghislain-Oxwold says. "Then our friends who were scouts were going every Saturday [to meetings]. They said it was really interesting, really fun." Ghislain-Oxwold, a university student in Bangui, says that his academics turned around after he became a scout. "It's thanks to the grace of the scouts that I passed my last exam." He is not sure whether that is because of the discipline he learned from the group, or whether it is simply because God was pleased with his decision. Scouts attend a mandatory two-week initiation camp, at which they learn basic survival skills like how to find shelter in the rainforest and start a fire. They are also taught several skills traditionally considered to be "girls' work" in CAR — laundry, dishwashing and cooking. It seems to be having an impact. At Ghislain-Oxwold's house, he neatly hangs his family's clothes on the line to dry. Not all their friends are scouts. Others have joined armed groups — which, like the scouts, provide a powerful sense of purpose and belonging. But the scouts in CAR and around the world are explicitly pacifist — a legacy of the disgust founder Lt. Gen. Robert Stephenson Smyth Baden-Powell felt toward the atrocities committed during World War I. In the context of a civil war, however, preaching pacifism can be a revolutionary act — and it's not always popular. Since the beginning of the civil war, thousands of Muslims have been among the victims. Many more have fled to neighboring countries. "If we don't defend ourselves, we will be eliminated. They are a majority. 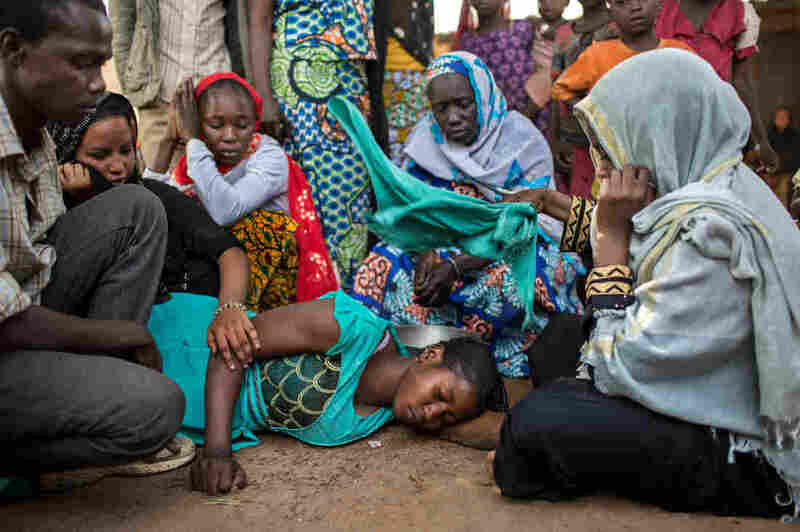 They have more weapons than we do," says Ali Ousman, the coordinator of Bangui's main Muslim civil society coalition. From Ousman's perspective, the boys who join the local armed groups are the real heroes. "Some youth are taking guns to defend PK5, [the Muslim enclave in Bangui] the only place where Muslims are allowed to live in Bangui," he says. "If they didn't, they would be killed, their parents would be killed, the old people would be killed. They had no choice." Ousman doesn't see the benefits the scouts are making, without using violence. "In reality, the Muslim scouts don't do anything," he says. The World Organization of the Scout Movement would disagree. "Scouts are playing an important role in the Central African Republic by providing essential non-formal education for youth affected by the conflict," says Frederic Tutu Kama-Kama, regional director of the Africa scout region. He cites their work with UNICEF as well as the World Health Organization and notes that, as in other countries like Burundi, Colombia and Iraq, "scouts are involved in peace-building processes. Our hope is that Scouting in the Central African Republic will soon become a member of the World Organization of the Scout Movement." But there are obstacles to overcome. The fees are still a problem, as is the fractured nature of CAR's scout movement: The Catholic scouts, the Muslim scouts and the Protestant arm believe they need to be under a single umbrella before they can rejoin the movement. 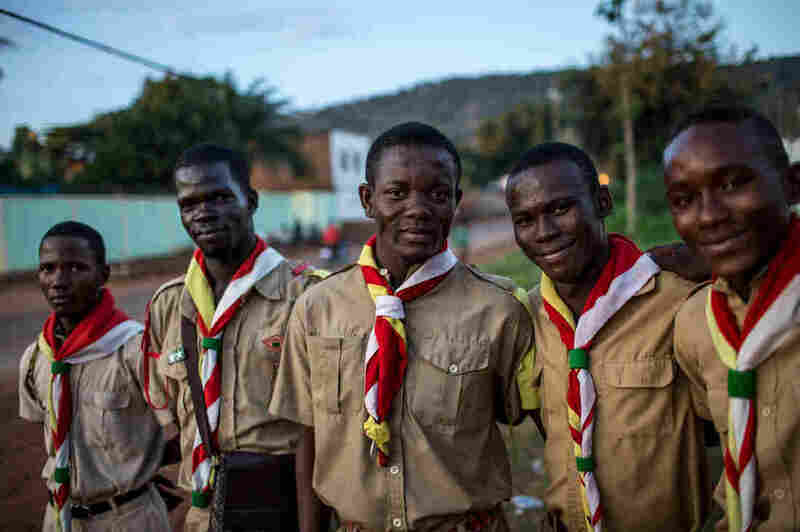 Another issue in the bid to rejoin the world organization is that the scout movement in CAR has, until recently, treated scouting as a boys-only endeavor. To participate internationally, the CAR needs girl scouts, too. "We are trying to tell people our movement is not for boys only," Bengai says. He doesn't sound all that convinced himself. But a troop of girls was founded in Bangui last year by the Catholic Scouts, and about 50 young women have joined. Historically, girls in CAR have had fewer options for both employment and recreation than boys. "Especially for Muslim girls, we can't really leave our neighborhood," says Mounira Aliman, a young woman who is a member of the Islamic Youth Center. "It's very important if they could include girl members in scouts." Rejoining the world scouting group would allow the movement to get more funding from the worldwide movement and partnerships to increase the scale of work. To really understand that value — and despite what critics like Ousman might say — one must consider what the scouts in CAR have been able to accomplish, and what other uniforms they might be donning without the group. "The armed groups do war," says Bengai. "The scouts are an army for peace." With additional reporting by Will Baxter, Abdoulaye Moussa and Amy Niang. A version of this feature was first published by South Africa's Mail & Guardian newspaper. It was produced as part of Uncovering Security, a media skills development programme run by the Thomson Reuters Foundation, the Stanley Foundation and the Gerda Henkel Stiftung.